Welcome to the new OpenStreetMap Contributors! The beginning of a radical change? : Neis One! Welcome to the new OpenStreetMap Contributors! The beginning of a radical change? Many blog posts reported in the last few weeks about Google’s changes to their Google Maps API and the new usage limits. If a website that implemented the Google Maps API receives too much traffic or hits e.g. more than 25,000 per day, charges will apply . This news caused some websites to start looking for alternatives and some of them switched to the OpenStreetMap (OSM) project. You can read more about how and why you should also switch to OSM on the great switch2osm.org webpage. and as Kai Krueger  mentioned it seemed that several new users contributed to OSM. I would like to add a few numbers especially to the last point mentioned above. Foursquare announced their switch to OSM on Feb. 29th, 2012. Before this announcement the OSM project would usually experience a growth of around 500 (+/- 200) new registered members every day in February. Out of these new members approximately 180 (+/- 50) contribute their first edit in OSM. Overall around 2100 +/- 100 members were active each day in February . However, these numbers changed the first day after the Foursquare announcement. The OSM project had an increase of around 1600 new members during that day (March 1st), and on the second day about 1100 new members joined OSM. On March 3rd the numbers went down to the usual 600 new registered members again. Out of those newly registered members during the first day after the Foursquare announcement about 700, at the second day about 450 and on March 3rd 250 members started to contribute to the project. 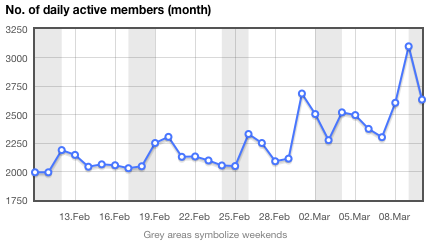 After Apple switched to OSM on March 8th the daily new member numbers started to increase again. On March 8th 1400, March 9th 1800 and yesterday 1000 new members registered to the OSM project. About 560 of the new members that joined on March 8th, 780 that joined on March 9th and 400 members that joined yesterday started to actively contribute to the project .